L. M. BALDWIN, Chief Sheriff of Maui County. NOAH A. ALULI, Lawyer of Maui County. W. A. McKAY, Candidate for Auditor of Maui County. F. WITTROCK, Candidate for Treasurer of Maui County. A. N. HASELDEN, Candidate for Supervisor of Maui County. W. H. King, Candidate for Supervisor of Maui County. W. H. RICE, Supervisor for Kauai County. J. K. IOSEPA, Supervisor for Maui County. GEORGE FAIRCHILD, Candidate for Supervisor of Kauai County. CHARLEY A. RICE, Tax Assessor and Collector of Kauai County. G. W. MAHIKOA, Supervisor of Kauai County. J. B. HANAIKE, Surveyor of Kauai County. 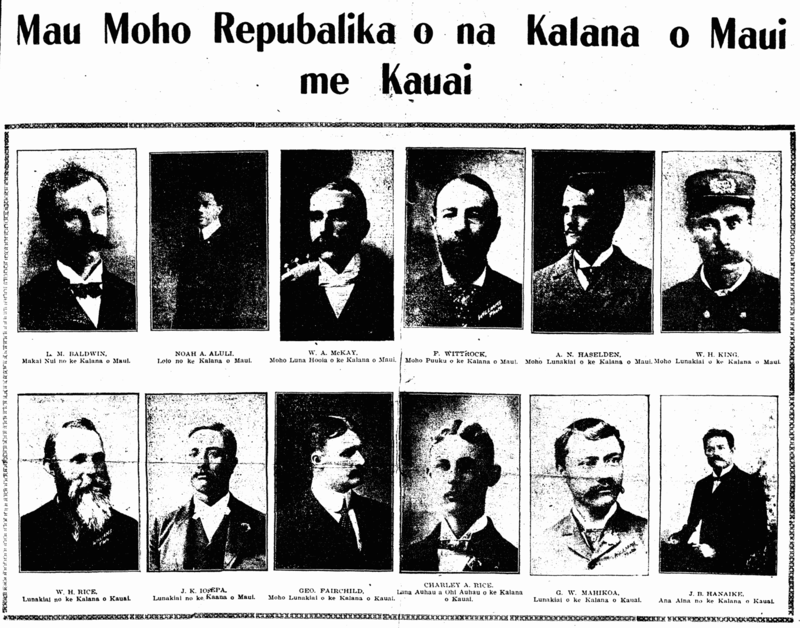 Ka Nupepa Kuokoa, Buke XLI, Helu 43, Aoao 1. Okatoba 23, 1903.